Fall is your favorite time of year- usually. 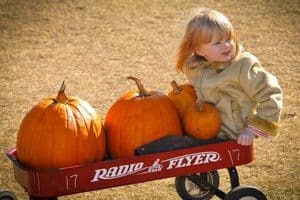 You love the changing leaves, the pumpkin pie, and the hundreds of excited visitors that come to your farm to pick out their Halloween jack o’lanterns and play with the baby goats. This fall, however, has not gone according to plan. A few days ago you received a call from the Minnesota Department of Health that three children have been diagnosed with an E.coli infection. The believed source of the E.coli: your pumpkin patch. You thought you took the right precautions; you always made sanitation a priority; you never wanted anyone to get sick. But, here you are. Although agritourism events serve as wonderful learning experiences, the interaction between animals and humans can cause disease outbreaks including Salmonella and E. coli. 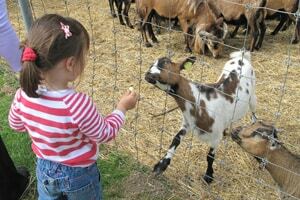 Agritourism is an opportunity for farms to allow guests onto the premises to enjoy some kind of agriculture experience. “The purpose of agritourism is to educate the public about agriculture while also providing supplemental income to farmers,” says Senior Epidemiologist at the Minnesota Department of Health (MDH) Carrie Klumb. Although agritourism events serve as wonderful learning experiences, the interaction between animals and humans can cause disease outbreaks including Salmonella and E. coli. The MDH tracks and analyzes disease outbreaks that are caused by human interaction with animals. “The health department’s goal is to foster relationships with producers and visitors of agritourism venues. Our focus is on education and prevention not regulation,” says Carrie. As a collaborative team, UMASH and the MDH have developed resources to promote health and safety on the farm. 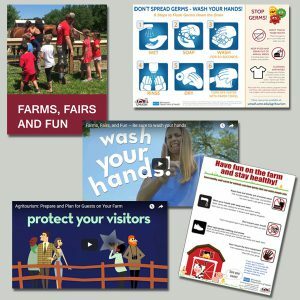 Educational videos were produced to highlight the importance of handwashing and to show how you can prepare and plan for guests on the farm. UMASH and MDH also worked together to create educational posters and the Animals in Public Settings Best Practices Checklist. These resources all stem from a national guidance called “The Compendium” that details the potential health risks and includes recommendations on facility design, animal contact, and distribution of food among other suggestions. All of these resources can be found on the UMASH website. Do I have the correct licensing to serve food and beverages? Where should I locate handwashing stations? What are the emergency steps to be taken if a bite or other animal injury occurs? View and download agritourism resources including posters, fact sheets, and videos.